Caro has lived more than half her life as an only child, and that’s the way she likes it. So when her stranger of an older sister returns home unexpectedly, she’s not sure how to handle it. Hannah left eleven years ago to join a convent, something that Caro has a hard time comprehending, and she has an even harder time understanding how Hannah fits into their family. But even though Hannah is home and everyone is trying to be happy about that, it’s obvious to Caro that Hannah is hiding some pretty big secrets: about why she joined the convent, why she left, and an event that occurred years ago and is still haunting her. 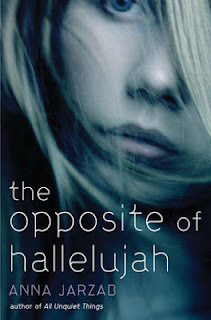 The Opposite of Hallelujah is a little slow to start, but Caro’s frank voice will soon hook readers. Though she may seem a little immature at times, her blunt, honest nature and sometimes guarded desire to work things out with her family is her redemption. Caro is a pretty curious character—she’s constantly probing at the connection between her family, religion, and science, wondering how things work. Sometimes she makes errors of judgment, and they hurt the relationships she has with her parents, Hannah, and her sort-of boyfriend, Pawel. The most interesting part of the novel is definitely the complex family dynamics and how Hannah’s secret and their parents’ denial has complicated her own life and Caro’s. All in all, everything comes together in the end, but not too easily or too neatly to be considered unrealistic. Jarzab leaves her characters with lots of hope, stronger relationships, and Caro is much more mature. The Opposite of Hallelujah is a great coming-of-age novel that isn’t afraid to tackle heavier subjects of life, death, faith, guilt, and forgiveness. Cover Comments: I really like the blue of this cover, and the close-up of the girl's face is an interesting and unique perspective. I had no idea what the book was about but it sounds like something I would really like.